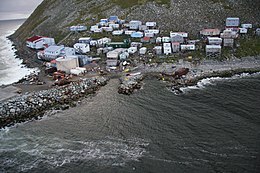 Little Diomede Island (Inupiat: Iŋaliq, formerly known as Krusenstern Island[a], Russian: Остров Крузенштерна, Ostrov Kruzenshterna) is an island of Alaska, United States. It is the smaller of the two Diomede Islands located in the middle of the Bering Strait between the Alaskan mainland and Siberia. The Diomede Islands are named after Saint Diomedes. Danish-Russian navigator Vitus Bering (after whom the Bering Strait is named) sighted the Diomede Islands on August 16 (O.S., August 27 N.S. ), 1728, the day on which the Russian Orthodox Church celebrates the memory of the saint. Summer temperatures average 40 to 50 °F (4–10 °C). Winter temperatures average from 10 to 6 °F (−12 – −14 °C) Annual precipitation averages 10 inches (250 mm), and annual snowfall averages 30 inches (76 cm). During summer months, cloudy skies and fog prevail. Winds blow consistently from the north, averaging 15 knots (17 mph; 28 km/h), with gusts of 60 to 80 miles per hour (97–129 km/h). The Bering Strait is generally frozen between mid-December and mid-June. Little Diomede was featured in the first episode of Full Circle with Michael Palin, a 1997 BBC documentary series in which the broadcaster Michael Palin traversed many of the countries of the Pacific Rim.